Hi friends! It’s Paula here with you today sharing my very first blog post! 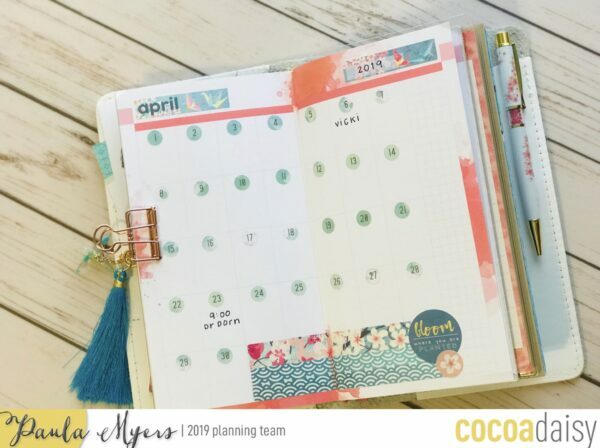 I am excited to share with you my April planner setup using the gorgeous Cherish Blossoms kit. 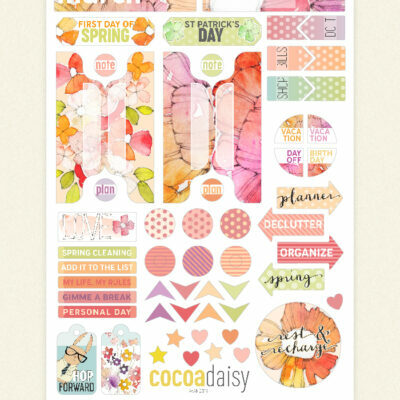 The beautiful, lush colors of this kit are the perfect representation of all the things blooming this time of year. I have 4 sections this month so let’s take a look! 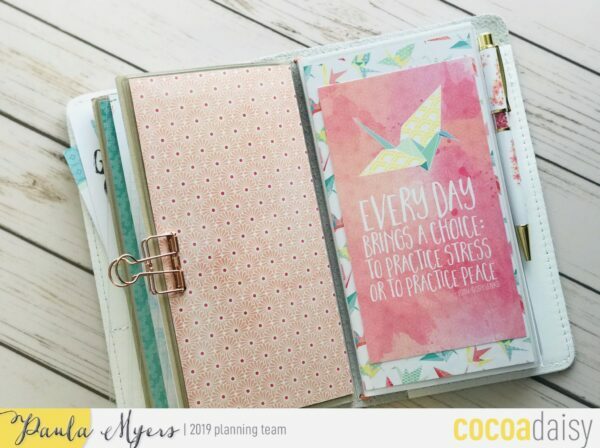 My pocket has a piece of colorful paper & a few pocket cards clipped in that make me smile every time I open my planner. 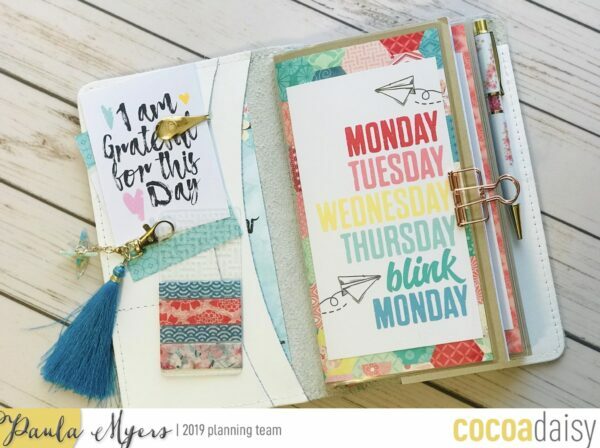 The dashboards were really a breeze to setup this month because Cocoa Daisy has done all the work! For each dashboard I trimmed 2 pieces of paper from the kit, one for the front & one for the back. Then I added a dashboard from the dashboard kit. Super easy! Inside of this dashboard is my monthly view using the undated Dori. Here again, Cocoa Daisy has done most of the work! I added stickers and washi and its ready to go. 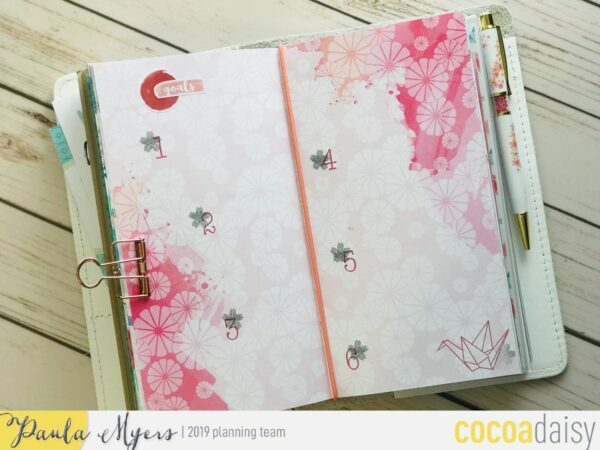 My second section is my main planning with the standard Dori. 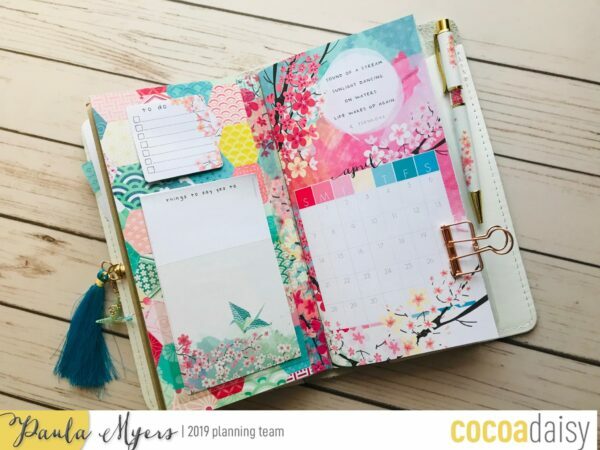 It has everything I need to stay on top of appointments & tasks. I have a sticky pocket on the inside cover that holds a few of the note pages. Above this I added some of the sticky notes so I always have a few on hand. In the weekly view, appointments will be on the left side & any tasks just to the right. 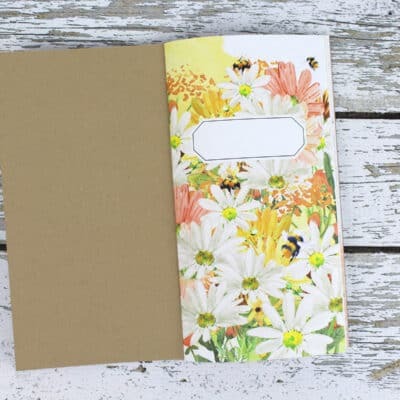 I made this cute bookmark with a pocket card & tab. 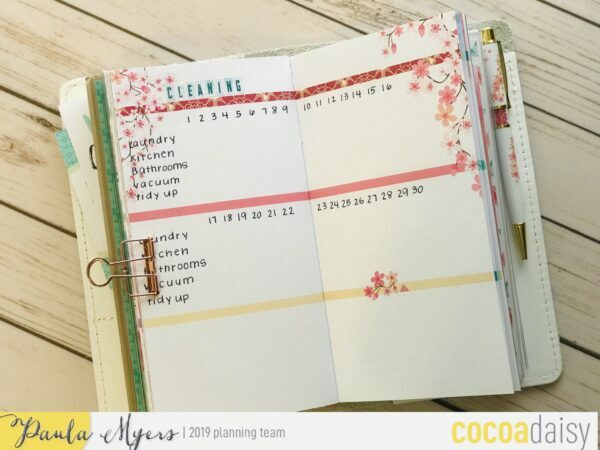 Also in my planning section is a daily cleaning tracker. I borrowed this idea from design teammate, Jennifer Crowder & I think it’s going to work well for me! Lastly, we have my goals page. 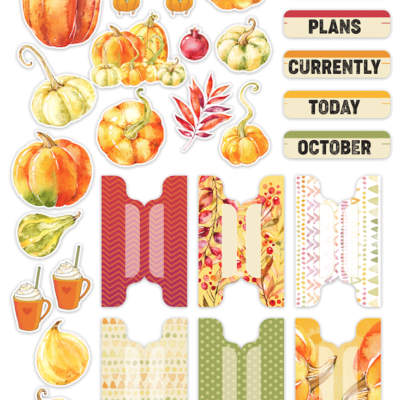 I added stickers and used number stamps from a previous kit to add structure to the page. My third section is for memory keeping in the Simple Dori. 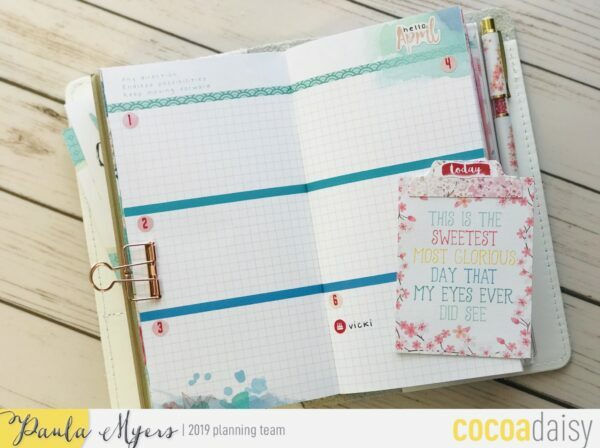 Having the Simple Dori in my planner is new for me this month. 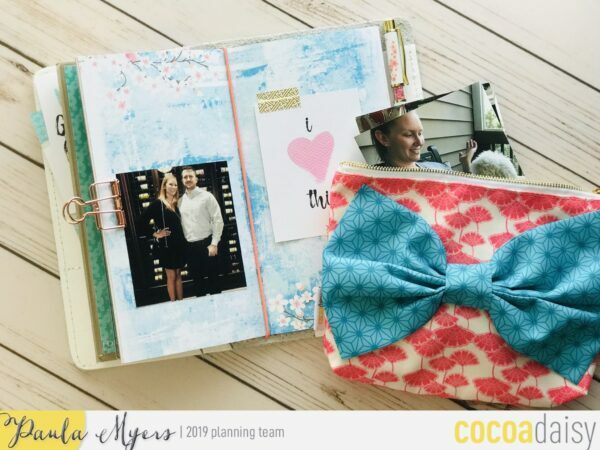 I keep a few pictures & basic tools on hand in the lovely planner pouch. The pre decorated pages & pocket cards make it super convenient for me to create layouts where ever I am. This is something I’m really looking forward to in April! 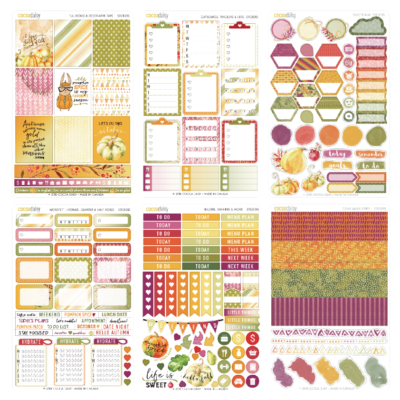 The last section is a blank grid insert for notes, lists, etc. I hope you’ve enjoyed my setup! If you have questions please let me know below. You can also find me on Instagram @thegildedmagnolia1.